2. In the bowl of an electric mixer, using the paddle attachment, beat the butter and sugar at medium-high speed until light and creamy, about 2 minutes. Add the egg, yolk, vanilla extract, and orange zest and mix until well blended. Reduce the speed to low and add the flour mixture one-third at a time, mixing just until combined. Turn the dough out onto a work surface and divide it into 4 pieces. Shape each piece into a disk, wrap well in plastic wrap, and refrigerate for at least 30 minutes, until firm (or up to 2 days). 3. Position a rack in the center of the oven and preheat the oven to 350°F (175°C). Line two baking sheets with parchment paper. 4. On a lightly floured work surface, roll one of the dough disks out to a thickness of 1/8 inch. Use a 4 1/2-inch snowflake-shaped cookie cutter to cut out the cookies. Using a 5/8-inch petal-shaped aspic cutter, cut out shapes from the interior of each snowflake or leave some without cutouts, if you want. (Save the scraps for rerolling.) If you plan to hang the snowflakes as ornaments, use a straw to cut out a hole on one of the points of each snowflake. 5. Using a metal spatula, transfer the cookies to the prepared baking sheet, spacing them 1/2 inch apart. Bake, one sheet at a time, for 10 to 15 minutes, until pale golden brown (baking time will vary depending on the size and shape of the cookies). Transfer the cookies to a cooling rack and cool completely. Repeat with the remaining dough. 6. Meanwhile in the bowl of an electric mixer, using the whisk attachment, beat the meringue powder, water, and confectioners’ sugar at medium-low speed until the icing forms stiff peaks, about 7 minutes. 7. Thin the icing to the consistency you want by adding a little warm water, a few drops at a time. 8. Transfer one-third of the icing to another bowl. Cover the surface of the icing with plastic wrap and set aside to use later to make designs on the iced cookies. 9. Add warm water to the remaining icing, a few drops at a time, until it does not leave a trail when it drops from a spoon and its consistency is slightly thicker than corn syrup. Dip a #6 round paintbrush into the icing and gently dab it onto the surface of one of the snowflake’s points, letting the icing gently drop onto the cookie without actually brushing it on. Continue to dab the icing onto the cookie, working with one section at a time, until the entire cookie is iced. Place the cookie on a baking sheet and set aside. Repeat with the remaining snowflakes. Let dry in a cool place for at least 2 hours. Discard any unused icing from that bowl. 10. Add warm water, a few drops, at a time to the reserved icing until it is thin enough to pipe a straight line smoothly and does not form peaks when a spoon is dipped into it. Fill a pastry bag fitted with a coupler and a #2 writing tip with the icing. Pipe small dots along the edges of a snowflake at 1/8-inch intervals. Do the same along the edges of the cutouts. Decorate the interior of the snowflake as you like, with dots, lines, and flourishes, or a filigree pattern. If the snowflake is to be solely decorative, pipe a few larger dots of icing on it and, using tweezers, arrange a dragée in the center of each one. While the icing is still wet, sprinkle the cookie with sanding sugar, tapping off the excess. Repeat with the remaining snowflakes. Let the icing dry completely, about 12 hours. Store in an airtight container at room temperature for up to 2 weeks. This is an excellent sugar cookie. First, it tastes great, even without the icing. The vanilla and orange flavors really come through and the consistency is perfect with just the right amount of crunch. Second, it's an easy dough to work with, provided you work with fairly small amounts of cold dough. I worked with a quarter of the dough each time, kept the other quarters in the refrigerator, and chilled the scraps before rerolling them. Also, a light dusting of flour on your rolling surface and rolling pin will keep the dough from sticking. If you don't have a petal-shaped aspic cutter to make shapes in the interior of the cookie, a piping top will work well or you can make them without interior cutouts. I used a #5 tip. As for the decorator's icing, I made a double batch of the recipe and had about half of it left over. I suggest making a single recipe and start to decorate. Depending on how you decide to decorate the cookies, you can easily make a second batch of icing if you need it. It took quite a bit of water get the water to flooding consistency, but you must add the water slowly. Once a small amount of icing dropped on top of the icing disappears quickly, you will know you have flooding consistency. I found it easier to dip the tops of the cookies into the icing rather than piping dots of icing. I did not use dragees. I added some white and blue sanding sugar to give the cookies a bit of sparkle. On others I used red and green sugar. And on others, I piped white and blue decorations using the half of icing that I did not add water to. The yield was 3 dozen cookies because I used a slightly smaller (3 1/2 inch) cookie cutter. The orange zest and vanilla give these buttery sugar cookies a wonderfully surprising twist. The aroma is quite amazing from the moment the zest is added to the dough and then again every time the cookie tin is opened. The dough is easy to handle and bakes up nicely. We made these very thin and crisp and then a few batches a bit thicker which resulted in a cookie crisp around the edges but chewy in the center. Both are delicious! The final cookie is beautiful and worth the extra effort. Enlist some helpers if decorating isn’t your thing! The dough rolled out easily with just a light dusting of flour. I transferred the snowflakes to the cookie sheet before I used the aspic cutter so there was less risk of my dough tearing. After starting to roll out and cut the cookies we found out we needed to take dessert to the cast and crew party at the high school for their fall production. So I quickly shifted gears and enlisted a teenage helper and went to a smaller 2 1/2-inch cookie cutter. I started out with the baking the first batch for 10 minutes but found them a bit too crisp. The rest I baked for 8 minutes. With rolling them out so thin they needed to be watched carefully. The icing came together easily and at 7 minutes was at a soft peak stage and took another 2 minutes to reach stiff peak. Every year I look at cookies like this and think they are so pretty that I should try decorating again. But I quickly reminded that this is best for some with a steadier hand and much more patience! I decorated these in stages. The smaller cookies I started out with using the paint brush method which I found an odd choice with the instructions to not use it as a brush. I then tried a wooden skewer to drop the paint on. I quickly found this tedious after a few cookies and switched to simply spreading the thin icing over the cookie. Once the icing dried I could not tell the difference between my various methods. Clearly this carefully decorating thing is not for me. For the smaller ones I spread the icing and then dusted them with sprinkles so we could use them that day. I saved the larger cookies to try the piping on. For the larger cookies we iced them first and once dried, then piped the icing on for finishing. My son declared he should take over and made some really beautiful designs. I found the icing was dry enough after a couple hours to serve them. Although you would need to full drying time if you wanted to use them for decorations. 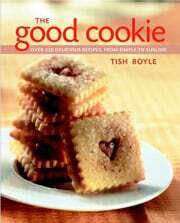 Snowflakes Cookies Recipe © 2002 Tish Boyle. Photo © 2002 John Uher. All rights reserved. All recipes and photos used with permission of the publisher. Hi, how can I buy these snowflake cookie cutters? They are perfect. Thank you. Snowflakes and Christmas trees are among my favorite Christmas cookies to make and decorate each year. I use white chocolate for these two projects and place the silver dragees on the snowflake and on the tree to represent Christmas decorations. It does take time, but I love doing it and they look beautiful. To Regina, who asked about where to purchase the snowflake cookie cutter: They are very easy to find. I own three different styles and sizes. I think the first one I purchased was at Zellers and the last two were at a kitchen store in the mall. My favorite tree cookie cutter is a plastic one I purchased years ago from the Hallmark card store. Keep your eyes open at the grocery stores too. Just make sure you take a look at the shape of the snowflake as some aren’t as nicely shaped as others and some may have sections of the design that will be too narrow and then as a result the cookie will be more fragile and could break. Lorrie, thanks for all the helpful info! Regina, I think Lorrie covered it nicely, don’t you? My pleasure, the only thing I should have done was actually replied to Regina’s comment instead of just posting so if she signed up to be notified she’d receive the email but I thought of that once I sent send. I hope she checks back.